↑ Floyd, Mark (June 13, 2008). "Scientists See Squid Attack Squid". LiveScience. สืบค้นเมื่อ October 25, 2011. 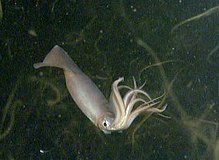 ↑ "Humboldt squid Found in Pebble Beach (2003)". Sanctuary Integrated Monitoring Network. สืบค้นเมื่อ 2011-10-25. ↑ Zeidberg, L. & B.H. Robinson 2007. Invasive range expansion by the Humboldt squid, Dosidicus gigas, in the eastern North Pacific. PNAS 104(31): 12948–12950. ↑ Blumenthal, Les (April 27, 2008). "Aggressive eating machines spotted on our coast (2008)". The News Tribune. สืบค้นเมื่อ 2011-10-25. หน้านี้แก้ไขล่าสุดเมื่อวันที่ 10 กุมภาพันธ์ 2562 เวลา 00:19 น.